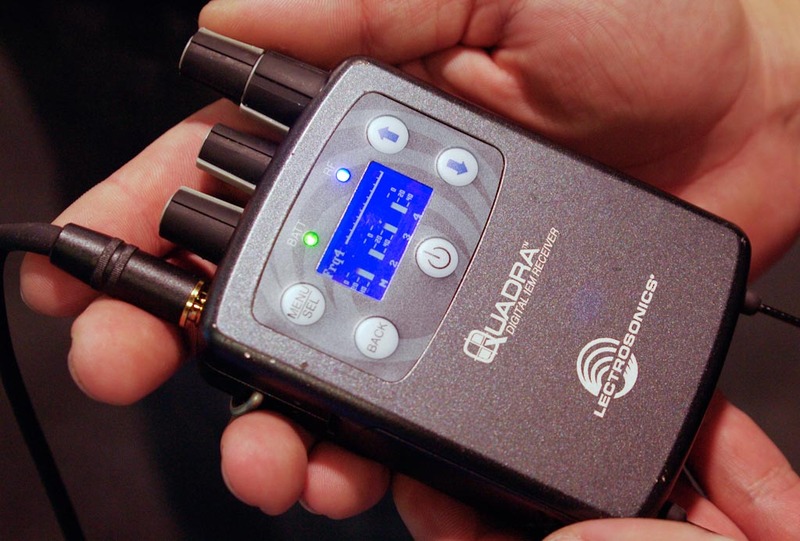 Lectrosonics Quadra IEM 4-Channel ReceiverSpeaking of wireless IEMs, Lectrosonics showed off their new Quadra IEM system. It's called the Quadra because, you guessed it, there are four channels of audio transmitted to each receiver. It's all digital using spread-spectrum technology and RF performance is said to be crazy-good. We listened to a brief demo and it sounded as good or better than any IEM I've ever heard. And the ability to send four channels could be a big plus in certain situations. Lectrosonics Quadra TransmitterConsider these options: First, you could send a stereo mix plus the performer's vocal and instrument. That gives them immediate "more me" control right on the pack. Or, you could send two stereo mixes (ch. 1&2 and ch. 3&4) from one transmitter and set up two packs to pick off their own stereo mix. That greatly increases transmitter density and saves some money on hardware. As is typical for Lectrosonics, the quality is extremely high; it's all engineered and built right here in the USA. It's also not cheap; figure around $3500-3800 a channel street. For churches it might be a bit steep. Then again, it might be exactly what some need.